Nike don’t make too many rugby shirts these days – Saracens, Argentina and Toulouse are about the only major teams they supply kit to – and that’s a real shame, because they continue to produce some really classy, innovative designs. Toulouse and Nike have been working together since the very first Heineken Cup (when rugby players and fans could get away with carrying some extra timber under their shirts – those were the days!) 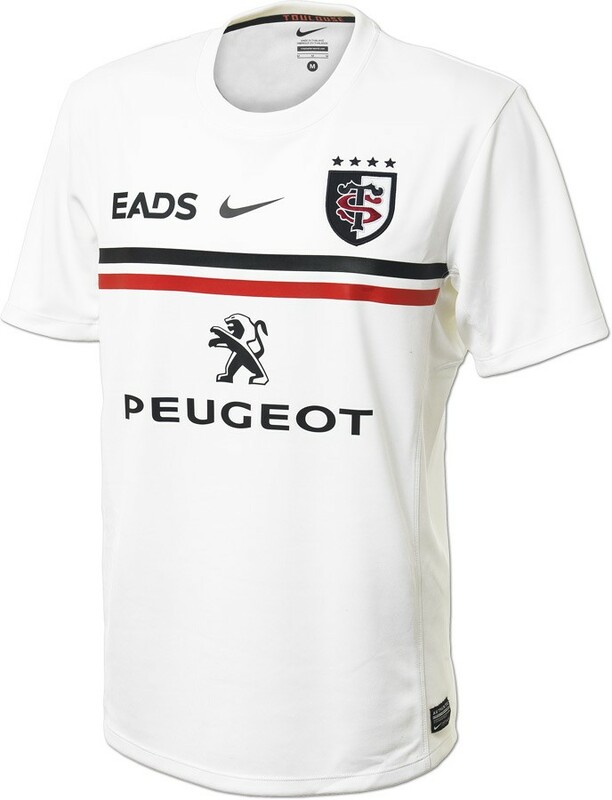 and as a result, the designers at Nike know exactly how to make a brilliant, fetching design. This one isn’t revolutionary, it’s not hugely bold – it’s just a really simple, really tasteful, really classic-looking rugby shirt. Honestly – don’t you wish this was your club’s shirt? 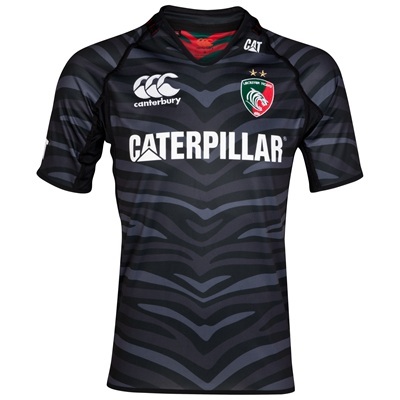 If you think this Leicester Tigers European shirt looks a little bit familiar, you’d be right. Rather than bring out a new shirt for this year, the Tigers have opted to stick with last year’s third shirt for this year’s tournament. As you’ll probably remember (as much as you might want to forget), last year’s Leicester home and away shirts were a tiger-striped travesty, and this shirt retains that ‘for the love of god what were you thinking?’ design theme. Thankfully, it’s substantially more subtle on this shirt, to the point where, from a distance it’s almost quite tasteful. Sadly, up close there’s no getting away from the fact that it has tiger-y bits all over it. As much as we respect Leicester for sticking with a kit for two whole seasons, this is one shirt we wouldn’t be sad to see the back of. Here at Rugby Shirt Watch we pride ourselves on sourcing the best images we can find to post in our round-ups. Sadly, sometimes a noteworthy shirt comes out and there are simply no decent images available to us. 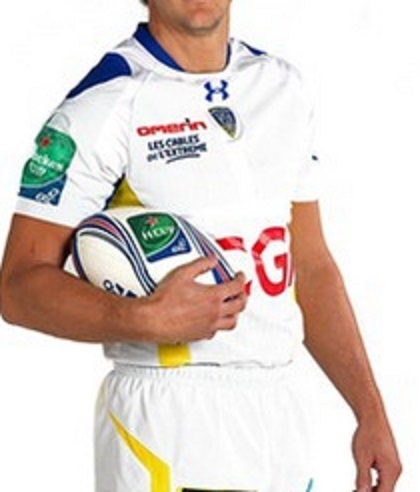 That, sadly has been the case with the 13/14 Clermont Euro shirt. It would be remiss of us to not feature a a shirt from last year’s finalists, but we simply weren’t able to source any decent images of the shirt itself, so apologies for the rubbish image above. 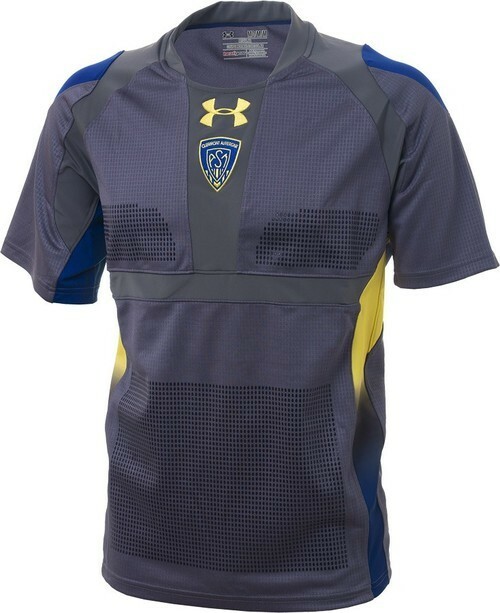 Moving on to the shirt itself then, and well, it’s hard to get hugely excited about this kit, simply because of how similar it is to other Clermont Heineken Cup shirts of recent years. Aside from there being a bit more blue and a little less yellow in this year’s effort, you’d be hard-pressed to spot the difference really. That, and the fact that this shirt means we’re unlikely to see the far more handsome and unusual grey away kit in the Heineken Cup this year means we’re somewhat underwhelmed. Check back tomorrow for the next installment of our Heineken Cup shirt round-up!